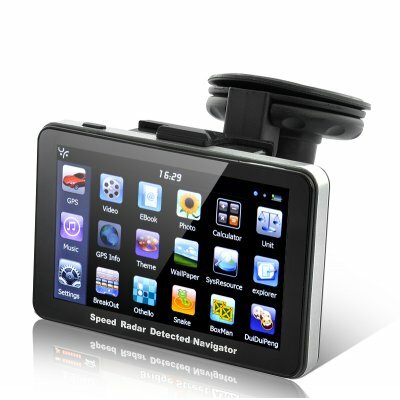 Successfully Added GPS Navigator "RadarBot" - 5 Inch, 4 GB, Built-in Speed Radar Detector to your Shopping Cart. The RadarBot is an excellent 2-in-1 SatNav device with built-in speed radar detection and GPS navigation. Built-in Speed Radar Detector: Outsmart the police who are trying to fine you by monitoring your speed with their radar gun. Reduce your speed on time to avoid being ticketed for speeding. This GPS Navigator with a built-in full frequency speed radar detector will send out warning in real voice in time, and can potentially save you a lot of money on fines. Powerful GPS Navigation: the “RadarBot” is also designed to help you find your destination without any delays. You can easily mount it on your windshield with the included mounting bracket. Experience amazing real-time GPS guidance that will notify you of every street and intersection and lead you to your destination, turn by turn. With the “RadarBot”, there’s no more looking up directions, printing maps and then trying to follow them with your fingers while riding. Quality In-Car Entertainment Center: With this device you do not have to dismantle your vehicle’s dashboard and install a car DVD player if you don’t want to. This handheld GPS navigator with built in multimedia applications offers you a variety of entertainment options for using it in your car, including music, video, games and e-book. Your media interests are well looked after with this great gadget and you can enjoy driving to its fullest. The “RadarBot” GPS Navigator with built-in speed radar detection is now in stock for world wide express shipping. Order now and we will ship out within one day! Brought to you by Chinavasion, the leader in GPS gadgets and wholesale electronics.